Cardinal's model CWL-40 portable axle weighers are rugged, but light enough for easy transport, weighing in at only 60 pounds per platform. They feature rechargeable battery power and can factor axle weight and gross weight. With Cardinal's model P150 battery-operated portable tape printer, you may print axle weight, gross weight, time, and date. Cardinal's model CWL-40 portable axle weighers are rugged, but light enough for easy transport, weighing in at only 60 pounds per platform. They feature rechargeable battery power and can factor axle weight and gross weight. 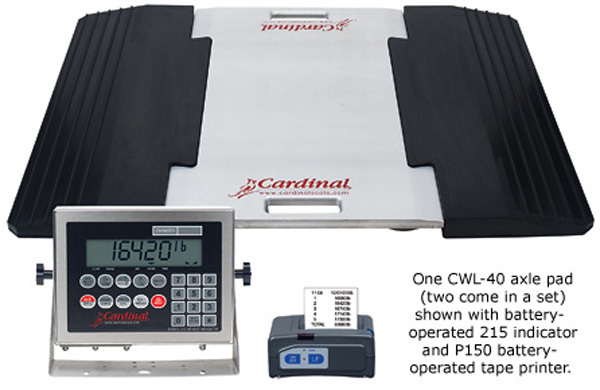 With Cardinal's model P150 battery-operated portable tape printer, you may print axle weight, gross weight, time, and date. The interlocking rubber ramps snap perfectly into place with the CWL-40's unique design. Rubber ramps for easy access. 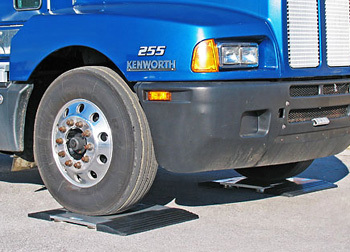 Ramps are interlocking and constructed from slip-resistant black rubber. Ramps measure 28 inches x 10 inches (71 x 25 cm).